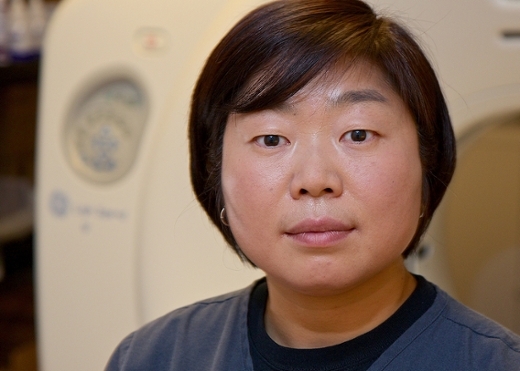 Mija Lim has been a clinical instructor for the Medical Imaging Program’s computed tomography minor track since 2012. In that time, she has built a strong reputation among our CT students, who describe her quality of work, professionalism and patient care as “truly amazing”. One student said, “Mija was always willing to teach me and never got frustrated when I had trouble catching on to something.” Her patience and willingness to share her knowledge are just two of Mija’s attributes as a clinical instructor. Mija grew up in Korea and came to the United States at the age of 27. While in Korea, she graduated college with a degree in International Trading, a field in which she would work for five years before leaving for America. In 2007, Mija graduated from the Chattanooga State radiography program in Tennessee. Once she earned her RT(R) credentials, she attended the Emory University Medical Imaging Bridge Program to complete her Bachelors of Medical Science degree. She graduated in 2009 and earned her CT credentials and a career as a CT Technologist at Winship Cancer Institute, where she has been perfecting her skills and sharing her knowledge for the past six years. Mija is an avid tennis player, competing on an Atlanta Lawn Tennis Association (ALTA) team. When she is not at work, she and her husband can be found on the tennis courts! The Medical Imaging Program thanks Mija for her service and her dedication to our students.